This is the narrow band of fast moving winds which runs from west to east across the Atlantic high up in the atmosphere. So why is the jet stream stuck so far south? The jet stream, like our weather, is subject to natural variability – that is the random nature of our weather which means it is different from week, month or year to the next. We expect it to move around and it has moved to the south of the UK in summertime many times before in the past. It has, however, been particularly persistent in holding that position this year – hence the prolonged unsettled weather. This could be due to natural variability – a bad run of coincidence, if you will – but climate scientists are conducting ongoing research to see if there are other factors at play. Changes in sea surface temperatures due to natural cycles may be playing a part, but there is more research to be done before anyone can establish how big a role they play. Research has also suggested that reducing amounts of Arctic sea-ice could be affecting weather patterns, but more research needs to be done to confirm this link. Currently Arctic sea-ice is at a record low for this time of year. In the long term, most climate models project drier UK summers – but it is possible there could be other influences of a changing climate which could override that signal on shorter timescales. If low levels of Arctic sea ice were found to be affecting the track of the jet stream, for example, this could be seen as linked to the warming of our climate – but this is currently an unknown. The Met Office Hadley Centre, working with climate research centres around the world, is making strides in determining how the odds of extreme weather happening have been influenced by climate change. However, it is very difficult to do this type of analysis with such highly variable rainfall events, so it may take many years before we could confirm how the odds of this summer’s wet weather happening have been altered by greenhouse gases. We do know that the warmer air is, the more moisture it can hold. We have seen a global temperature increase of more than 0.7 deg C (since pre-industrial times) and this has led to an increase of about 4-5% in atmospheric moisture. This means that when we do get unusual weather patterns such as we’re seeing now, it’s likely there will be more rainfall than the same patterns might have produced in the past. In short, it seems when it does rain, it is heavier. Taking into account this effect, perhaps it’s not surprising new records like those for this April and June are being set. In fact, the wettest July and November in the records dating back to 1910 happened in 2009, making a total of four record wettest months in the past four years. If wet months occurred randomly, we would expect only one record to have been broken since 2006. For temperature, April (2011), May (2008), July (2006), September (2006) are all recent warmest records. Again, this is much more frequent than would be expected if temperatures were not rising. What about elsewhere in the world? Looking at the bigger picture, the jet stream may be having an impact elsewhere in the northern hemisphere. It is stuck in a persistent pattern of waves, with one of these ‘waves’ taking it to the south of the UK. 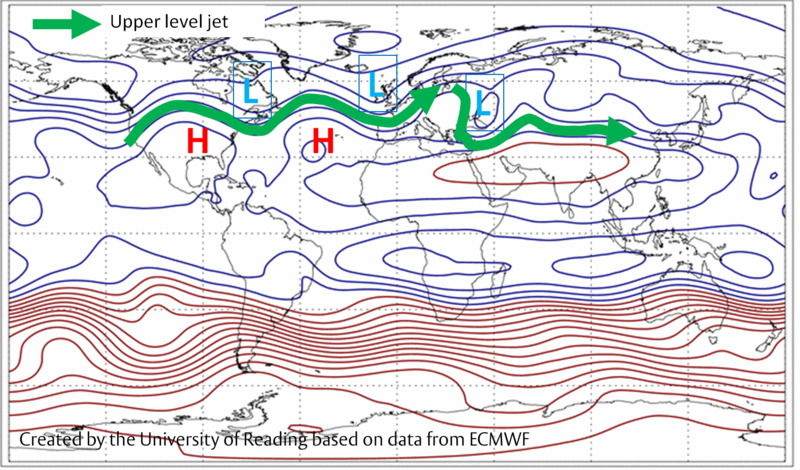 Figure shows upper level wind patterns in early July 2012, with the northern hemisphere jet stream marked with arrows. The figure gives a picture of the upper level winds for the first week in July, but the wavy nature of the jet stream has been persistent throughout June. Meanders of the jet north and south can be seen across the US, the Atlantic and into Europe. While the wet weather in the UK has been under a southward meander of the jet stream, the recent Russian floods near the Black Sea appear to have been beneath the next trough to the east. The US heat wave is also beneath a northward meander and a ridge of high pressure. * This article has been written in collaboration with the Walker Institute for Climate System Research, University of Reading. This entry was posted in Met Office News and tagged Arctic sea ice, climate change, flood, flooding, Jet stream, Met Office, sea surface temperatures, summer, UK, university of reading, walker institute, washout, weather. Bookmark the permalink. So what you’re saying is that it’s quite possible that climate change is causing the jet stream to be so far south this summer .. without actually saying that climate change is causing the jet stream to be so far south this summer. I guess history tells you to be very cautious about climbing off the fence. We understand. Let’s hope our grandchildren are as understanding. John, thank you for the comment. Climate change may be contributing to what we are seeing in the UK and other parts of the world right now, but it is not possible to say right now that it certainly is or how much of an influence it may be having. As the blog post says, there are other potential ‘suspects’ lining up as well. The Met Office will continue to research this developing area of meteorology. Your pieces are coming out too wide for my screen. Could you please make the line lengths shorter. Sorry Arthur, I am not too sure why that would happen. I will take a look at this. Thank you, Dave. No problem with this page. If the jet stream stays in this position over winter will the rain be snow? Is this probable or possible? Personally I love the snow but if this is possible I will start stocking up now. Gillian, that is not a simple question to answer. If the jet stream stays as it is then very often we will continue to see westerly winds, which are that little bit milder, even in winter. This reduces the risk of snow. However at times, just like now we will occasionally see northerly winds that may bring an increase in the risk of snow. What ever happens our short range one to five day forecasts and warnings will keep you informed. What a disappointingly unhelpful reply. I am sure most on here have glanced online/ newspapers/ tv for a 5 day weather forecast. The reason for coming to this site (amongst other things) was in the hope of a better insight into what the remainder of the summer months may hold- ie july and august – not to simply be referred to the usual weather sites for a short term outlook. I appreciate it is impossible to be precise, but an educated prediction would have been infinitely more helpful. I understand the monsoon last for about 5 months, so end of August might see some sunlight? Could the jet stream slip back north of the uk at any time? So the weather could vastly improve at short notice? Or does it move slowly over a period of time so we are doomed to rubbish weather for the rest of the summer? Dominic, the jet stream can both move slowly and more quickly, oscillating across the north atlantic. There are signs of the weather improving toward the end of this week and into next. Thanks for this post, it was interesting! Hello and thanks for a very enlightening article! In Iceland we experienced a recordbraking June 2012. In Stykkishólmur, western Iceland, a sequence of measurements of temperature and precipitation (along with other factors), unbroken since 1846, has shown this June to be the driest of them all, with only 0,6 mm of precipitation. So far, July has been almost completely dry in western Iceland and warmer than average, as was June. So we have problems with drought. Presumably global warming means there is more energy in the system due to greater temperature differentials – therefore bigger cyclones – therefore a wavier jetstream, and you are trying to deduce whether this is the prevailing factor and checking whether subsidiary factors are minor influences? This is a big guess as I could not find out what powers the jetstream and this may also have a big influence? Has any research been conducted to see whether the jet stream could be blocked or moved? 150mph + hurricanes, at some time in the future ? what a terrifying prospect for our children. Has the volcanic ash cloud of 2010 caused the jet stream to come further south and affect the weather in the UK? This wasn’t one of the topics discussed today, but it is unlikely that the volcanic eruption of 2010 in iceland has influenced the position of the jet stream.